Team Merlot hit the track at Donnington Park. Click here for loads more photos. 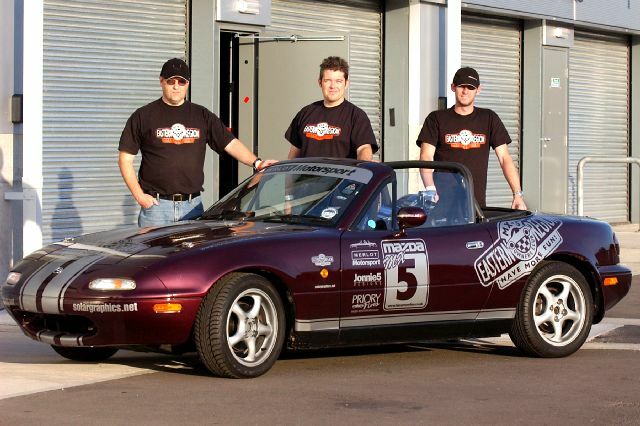 WITH his heart racing, Jon Elsey gripped the wheel and steered ‘Project Merlot’ on to the circuit for the first time. It was the moment he and fellow Eastern Region mates had been working towards for weeks - but within minutes the car’s debut at Donington Park became spectacular for all the wrong reasons. Martin Curtis, Robbie Marsh and Jon had spent hundreds of hours renovating the ten-year-old MX-5. They had transformed it from a rusty wreck to a race car, in just eight weeks. Jon was on his third lap rounding Redgate Corner, when a cloud of white smoke engulfed the car. “My first thought was that the engine had blown up,” he said. But in the pits he lifted the bonnet, to discover a hose had split. He said: “I knew instantly it was the heater hose,” and he was able to fix it. 20-nailbiting-minutes later, the car was ready for the remainder of the day’s sessions - which were more about the love of driving, than competing to win. There were seven 20-minute sessions during the day, so Jon, Martin and Robbie drove for two each, and as the day progressed, their lap times improved. They shared the final session between them, darting in to the pits for Le Mans-style driver changes. When the sun set, the trio headed home to East Anglia. Martin said: “We’d all been a bit quiet and nervous the night before. The day was nerve-racking, but exciting and quite a scary experience,” .”said Martin. They paid just £50 for the car, plus £150 to pay off the previous owner’s garage bill and get it delivered. But more money has been spent since, on rebuilding the car for track days. The idea was always to make the project pay for itself, and Martin keeps detailed accounts. So far the project has cost them around £150 each, including insurance and road tax. 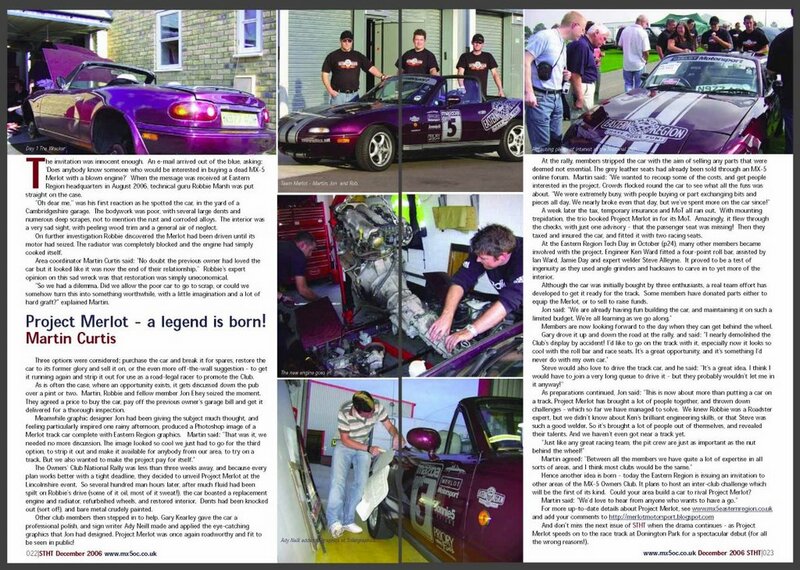 The Donington drive came after ER an Eastern Region Tech Day, a report of which featured in the last issue of STHT. Then came a fortnight of hard work for the trio and fellow member Ken Ward, who offered his skills as a precision engineer. Ken, who runs Godfreys Precision Engineers at Beccles in Suffolk, crafted a metal bar to fit the racing harness to. He even engraved the words ‘Merlot Motorsport’ on it, and designed and made a clever mount for a video camera. 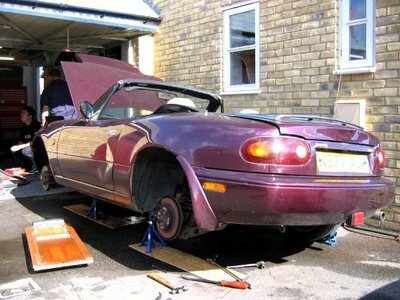 Jon bought an extra set of wheels through e-bay, which cost the princely sum of £56. He said: “They had the most intriguing description which would have put most buyers off. The seller was saying ‘you don’t want to buy these because they are so bad’ – so we did! E-bay also proved a useful tool to find the Sparco pro racing harness, and they had already bought both racing seats off the website, and opened an account to sell off surplus parts. Robbie also fitted second-hand performance springs and shock absorbers, and re-aligned the wheels. In the lead-up to Donington, Robbie was a lecturer at Huntingdonshire Regional College, where students on the motorsport course were keen to help with Project Merlot. Two pupils even pledged to buy their own MX-5s in future. They helped weigh the car, and discovered that stripping parts had lightened it by ten per cent. It now weighs 975kg, with many parts still to come off. Jon, Martin and Robbie then added the final touches to get the car ready for the track, like bonnet clips (which came straight from ‘the chav section at Halfords’), a detachable number plate, and a fire extinguisher - at Jon’s insistence. After being black-flagged at Donington when the car was out-classed by speedier drivers, Martin said: “We realised there’s probably a lot more to this racing driver thing than we’d thought! Merlot in the Movies ! 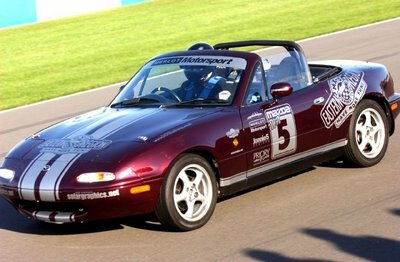 Project Merlot makes its first appearance on YouTube blasting down the Pit Straight at Donnington Park. Looks like it could be Jonnie Boy in the drivers seat. Not often he gets overtaken..! 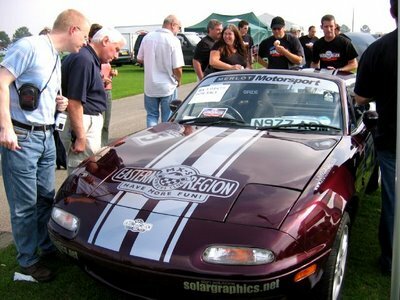 Project Merlot, unveiled to the public and attracting lots of attention at the MX-5 Owners Club National Rally in September 06 just a few weeks after the wrecker first arrived on Robbies drive way ! Day 1 and the wrecker arrives on Robbies Drive. Not long after arrival the new engine goes in. Robbie and Jon do all the hard work whilst Martin watches and takes the all important photos!